An accurate speedo together with cool gadgets for around the price of a tank of petrol. Why replace the standard speedo? My Seven has a Caterham-branded speedometer, and I'm not impressed with the quality of the device. The speedo has never been very accurate - it seems to read about 10-15 mph too high, and the needle bounces around the indicated speed. On top of that, the odometer packed in. A search of the Sevens list archive showed that these were fairly common problems. I didn't want to replace the gauge with something that was equally likely to fail, so the search was on for a better replacement. My primary requirement was for an accurate speedo and odometer, but any extra cool gadgets would be welcome too. I would have liked one of the Stack systems, like the ST500SR, or possibly even one of their cool systems that do everything (including fuel gauge) in one. Unfortunately, they are simply too expensive for me at the moment. VDO do an electronic speedo that would have done the job, but once the cost of the sender is added it would have cost about £200, which I couldn't afford to throw away should I switch to a Stack system at a later date. SPA make a digital speedo with an LCD display, which has a backlight and times the 0-60 dash, but it doesn't look like it should cost just under £200. Realising that I couldn't bring myself to spend lots of money on this particular piece of equipment (after all, it doesn't make the car any quicker), I started to look at bicycle speedos. There has been much talk about these on the Sevens mailing list, and the people that have successfully installed them seem pleased with the results; they can give very accurate speed readings if you measure the wheel circumference carefully. My more mechanically- and electrically-minded friend, Steve Foster, also wrote an article for the Lotus Seven Club magazine, Low Flying, describing his bike computer installation. List wisdom was to buy a Sigma because they were known to work at high speeds - a quick check of their web site showed that indeed they claim to work at over 180 mph. I would ideally have liked a speedo with a backlight, because I wanted this to replace my regular gauge, so I set about researching all of the bike speedos I could find. I couldn't uncover one which both had a backlight, and I could be sure would read Seven speeds, so I ended up going for a Sigma. I was all set to go for the BC800 because I didn't need the extra features of the BC1200 (which are mainly of use when swapping it between two bicycles), until I found out that the 1200 was £6 cheaper! What you get in the box when you buy a Sigma BC1200. 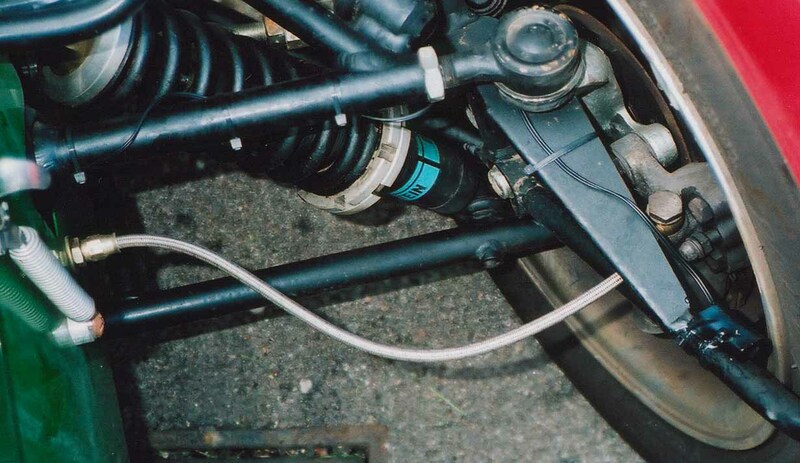 Some people have installed their bike computers in cars so as to take readings from the propshaft. I decided to do it the easy way, in as similar a manner as possible to its normal application, and stick the magnet on the wheel, mount the sensor nearby, and have the bracket somewhere in the cockpit. Before I made any of the irreversible modifications to the Sigma, I tested it by clipping the computer into the bracket then repeatedly waving the magnet in front of the sensor, which correctly caused a speed reading on the display. The wire joining the sensor to the bracket is far too short for use in a Seven, so I extended it. I think any old twin-core cable would do. I couldn't find any that was as thin as the wire supplied, so I used Halfords Professional Speaker wire because that was all I could get hold of. I placed the sensor on the cycle wing stay, where I intended to mount it, and cut the supplied wire so that the join would be just inside the car. I measured a bit of new wire long enough to stretch along an existing cable run and into the cockpit, and then soldered the three pieces together, remembering to feed the new wire into the cockpit before soldering it to the bit hanging from the bracket. I tried using heat-shrink around the wire joints, but it didn't work very well (possibly because of the difference in the wire sizes), so I ended up using insulation tape, first around each individual conductor, then again around the whole wire. Mike Ashurst suggested using electrician's self-amalgamating tape, which is similar but bonds to itself to create a very good seal. I will try this if I have to do it again. The magnet, liberated from its plastic prison. Align the magnet with the sensor like this in order to ensure that movement of the magnet is detected. I broke the magnet out of its plastic housing using wire cutters, and stuck it to the inside of the wheel rim using epoxy resin. I didn't trust the elastic bands supplied with the Sigma, so I used small tie-wraps to mount the sensor. To check that it was in the correct place I jacked up the car, and spun the wheel, while watching the computer display to make sure that it was picking up the pulses. After I calibrated the computer (see the next section) I took my car for a short, slow drive just to check that everything seemed to work OK. Then I used more epoxy resin to make sure that the sensor wouldn't move. This was the most difficult bit. The bracket has a curved back, because it is designed to be mounted on handlebars. I thought for some time about how to make the back flat so that I could mount it on the Seven's dash. The computer slides into the bracket from the top. This means that I couldn't mount it too close to anything else, or the top of the dash, or I wouldn't be able to remove the computer from the bracket. These two things had me puzzling for ages. For my test run I had temporarily fixed the Sigma to the top rim of the steering wheel using the elastic band supplied, because the rim was just the right shape to fit the curved back of the bracket. It took me quite some time to realise that I could mount the bracket onto one of the horizontal spokes of the steering wheel, and get the same effect without it getting in my way. The Sigma computer bracket, mounted on my steering wheel. The computer, mounted on the bracket. Nick Ryan has another solution, which is useful if you have a removable steering wheel, but it stops you from using the tonneau. As described in the Sigma instructions, you need to measure the rolling circumference of the wheel, in millimetres. Ideally you would probably measure about 10 revolutions, and then divide back down to get the figure for one, in order to reduce error. I only had space on the drive to measure one revolution. Example: My car has 14" Yokohama A509's with 4mm of tread. The rolling circumference came out at 1755mm. One feature of the BC1200 that is useful to me is that you can program in the odometer reading when the batteries are replaced. The BC1200 also has features to allow you to use the device on two bicycles; one thing it can do is to display the total distance travelled on both bikes. I make use of this feature by setting the initial distance for bike 2 to be the reading on my now-defunct original odometer; the computer adds this to the distance I have travelled since installing it (bike 1), to give the total distance travelled. That's all well and good, but I had heard that the radius of a tyre increases as its speed of rotation increases. This would mean that the accuracy of the bike computer would decrease as speed increased, which is the exact opposite of what I wanted. I decided that I would check the accuracy of my speedo over a measured mile, and then recalibrate it so that it was most accurate around the 60-80 mph area. The Speed-Trap Bible has a good account of how to do this. I was pleasantly surprised by the results of my test. With the proviso that these results are dependent upon my ability to drive at a constant speed for a mile, the bike speedo has essentially no error. 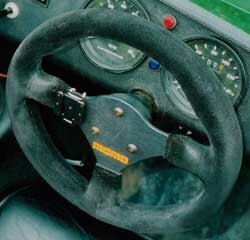 Compare this with the results for the Caterham speedo, below. The Raleigh bike computer in Steve Foster's Seven gave similarly accurate results. My original speedo reads about 10 mph too fast, which results in huge inaccuracies at low speeds. I hope most Caterhams are better, because this level of error is simply ridiculous. I have no problems with the few unrecorded miles I did between the old odometer breaking and me fitting the Sigma, since my original odometer probably has about 4,000 non-existent miles on it (there were 20,000 miles indicated, and I can usually average about 50 mph on my trip to work). The Caterham speedo on Steve's car was only 6% - 9% fast (it wasn't simply x mph out like mine). The only difference on his car which is obviously relevant is that he has 16" HPC wheels. This is the best £18 I have ever spent on my Seven. If you're going to avoid getting caught for speeding, it helps to actually know when you are speeding, and the Sigma performs this function perfectly. The maximum speed and average speed functions also make the drive to work much more interesting. 0-60 timer (there's probably not much call for this on a bicycle, but I would have thought that a configurable x-y timer might be interesting to the intended market). Please let me know if you find anything reasonably cheap that has these functions. The BikeBrain and Bikini systems both allow you to use a Palm PDA as a bike computer, draw graphs on the Palm, upload the data to a PC, and import them to a spreadsheet for further analysis. 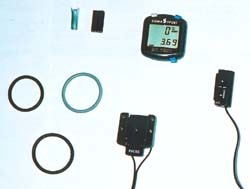 Some of the more advanced bike computers allow data to be logged (usually at a maximum sample rate of every 5 seconds), so that it can be uploaded to a PC later. Some can log heart-rate as well as speed and cadence. Examples of this kind of system are made by CatEye. Another bike computer that looked cool is the Topeak Panoram. This displays all of its information simultaneously, has a backlight, and reads up to 120 mph. Unfortunately I couldn't find anywhere that sells them so that I could get a decent look, and the web site is a bit short on detail. The Avocet bike computers use a ring containing 20 magnets on the wheel in order to provide increased low-speed accuracy, and faster refreshing of the display, but I couldn't see how I would fix this to a car, and the odometer only reads up to 19,999. One thing I am thinking of doing is fitting the BC1200 into a new case, including an LED as a backlight, and powering it all from the car battery. If you have anything useful, interesting, or just plain cool to add about bike computers and Sevens then please let me know. 44 West Street, Reading, Berkshire, RG1 1TZ. Tel: 0118 951 0949. This is where I bought my Sigma BC1200 bicycle computer from. They claim to to do mail order, so if you are having trouble finding somewhere local that stocks Sigmas then it might be worth giving them a ring. 16 June 2000: I have heard that Freewheel no longer stock Sigma bike computers, and now concentrate on CatEye instead. Might still be worth a try though. There are quite a few sites describing how to fit a bike computer to a motorbike, and some of them have useful info and pictures. Fitting a Sigma to a 900RR is particularly good, and includes links to lots of other sites about fitting bike computers. Nick Ryan's method of mounting the bike computer on the Seven's dash is very neat. 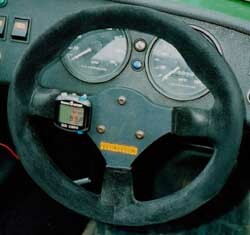 24 August 2000: Added details of using self-amalgamating tape, and a link to a neat method of installing the computer on the dash. 16 June 2000: Added details of checking calibration using a measured-mile. 22 May 2000: Original version published. This page is http://www.strangely.org/owned/bikecomp/index.html. It was first published on Monday 22 May, 2000 and last updated on Tuesday 27 July, 2004.